Glaciers And The Distraction Of The West Antarctic Ice Sheet (WAIS) | Watts Up With That? Glaciers are in the news again. An article by James Hansen about Antarctica and another published by Geophysical Research Letters about Greenland raise the specter of sea level rise. They are purely speculative and don’t bear investigation, but that doesn’t matter because the headline is the objective. The wider purpose and the reason glaciers are the target is the upcoming climate Conference of the Parties (COP21) scheduled for Paris in November. Polls show the lack of public concern about global warming or climate change, which necessitated a return to a tried and successful alarmist strategy. Hansen’s article focuses on the West Antarctic Ice Sheet (WAIS), which was the NASA focus from the start. It didn’t take long for the verdict on the West Antarctic Ice Sheet to come in. “Unstable,” wrote Ohio State University glaciologist John Mercer in 1968. It was identified then and remains today the single largest threat of rapid sea level rise. NASA promotes the same message now, except they are not as certain as Hansen. Even as Rignot and colleagues suggest that loss of the Amundsen Sea embayment glaciers appears inevitable, it remains extremely difficult to predict exactly how this ice loss will unfold and how long it will take. A conservative estimate is that it could take several centuries. The region contains enough ice to raise global sea levels by 4 feet (1.2 meters). The trouble is they don’t explain the calculation. Presumably, it is all the ice above and below sea level, but it doesn’t matter it is a big enough number to raise an alarm. When I ask people what is wrong with global warming, they pause, often for some time, before saying, glaciers melting and sea level rising. It is foremost in their minds because of the exploitation in Al Gore’s movie. 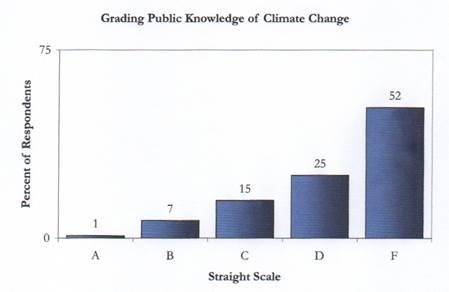 A study of public climate knowledge by Yale researchers illustrates the point (Figure 1). The correct answers, according to the Yale researchers, are given in brackets as True (T), or False (F). No wonder, in the overall results, 77 percent failed (Figure 2). In the options, it is illogical to claim Arctic Ocean ice melting. If you claim Arctic sea ice causes sea level change, then why not Antarctic sea ice? Of course, claiming either is wrong because the ice is formed from seawater. There is likely a minimal sea level change because the ice is 6-7 percent greater in volume, but that is likely balanced because a portion of the sea ice is above sea level. 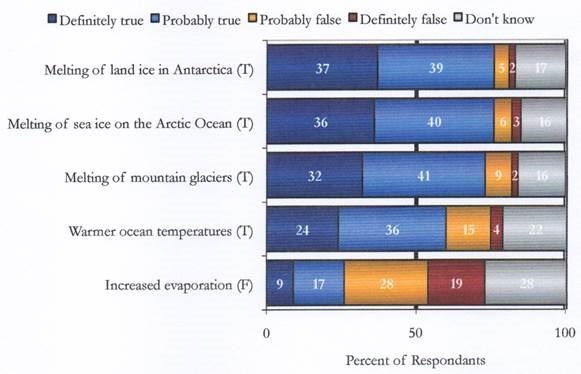 Majorities of the 76 percent who believe melting Arctic sea ice raises sea level, likely do so because of the Gore deception. It is why the animation sequences of water over-running the land are a major part of the movie. He added the false emotive factor of drowning polar bears for a persuasive combination. Other options for a source of melt water to raise global sea level are equally limited. They don’t mention Greenland or changes in the isostatic balance of land. The options and answers reflect the simplistic and fallacious arguments about sea level. Estimates of the total ice and water it contained produced a volume of water then added to existing sea level. Here is an exercise circulated for teachers by NASA in 1997. Exercise: Determine the amount that sea level would rise, averaged around the globe, in response to the complete melting of (a) the Greenland ice sheet, (b) the Antarctic ice sheet, and (c) both the Greenland and Antarctic ice sheets. The exercise offers some discussion of limitations but results in the following numbers. 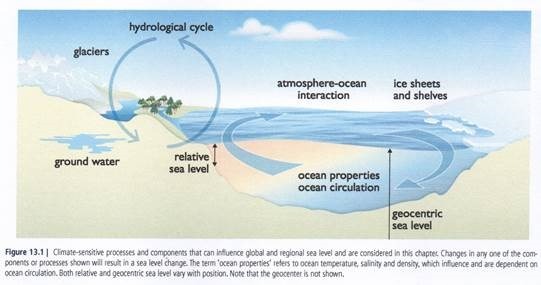 (4) Calculate the sea-level-rise answers by dividing the water volumes determined in #3 by the global surface-water area determined in #1, thereby spreading the effect of the ice sheet’s water throughout the expanse of the Earth’s surface-water area. The answers are: (a) (2,343,728 cubic kilometers)/(361,132,000 square kilometers) = 0.0065 kilometers = 6.5 meters for the Greenland ice sheet; (b) (26,384,368 cubic kilometers)/(361,132,000 square kilometers) = 0.0731 kilometers = 73.1 meters for the Antarctic ice sheet; (c) 6.5 meters + 73.1 meters = 79.6 meters for Greenland and Antarctica together. No knowledgeable person expects the Greenland and Antarctic ice sheets to disappear completely within the lifetime of anyone alive today, or within the lifetime of any of their children or grandchildren. Hence, the threat of a 79.6- meter sea level rise should not be seen as an immediate concern. Thank goodness! But the relief is short-lived because the final paragraph identifies some limitations, but alarmism remains central. These two ice sheets, however, are the largest potential contributors to sea level rise, and concern has been raised in particular over the possibility that the portion of the Antarctic ice sheet termed the West Antarctic ice sheet, lying largely in the western hemisphere, might be unstable and might decay relatively rapidly, perhaps even causing sea level rises of several meters within 100 years. Although such a decay is not highly probable, it is possible, and if it were to occur, the resulting several-meter sea level rise would cause serious economic and personal consequences to all highly populated low- lying coastal regions. The actual exercise requires determining what percentage of the ice in the Greenland and Antarctic ice sheets is above sea level. Only melt water from that ice can contribute to sea level rise. An adjustment is necessary because the volume of the ice is approximately 6% more than the volume of the melt water. Then you have to calculate and allow for crustal deformation and isostatic adjustment for a reasonably accurate measure. A few years ago, before it became politically motivated, Scientific American produced useful overview articles, such as John Eddy’s the Case of the Missing Sunspots. 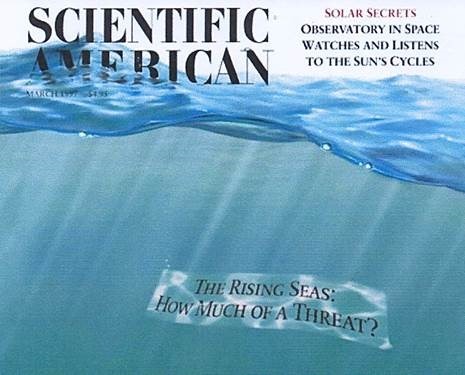 A March 1997 article asked, “How much of a threat are rising sea levels. Therefore, the closure of the sea level budget to date does not test the reliability of ice-sheet models in projecting future rapid dynamical change; we have only medium confidence in these models, on the basis of theoretical and empirical understanding of the relevant processes and observations of changes up to the present. The Report identifies some of the limitations. They identify three categories of confidence, Low, Medium, and High. Do we assume that Medium is 50 percent? It is reasonable considering the limitations they identify. Nevertheless, three central issues remained. First, the observed sea level rise over decades was larger than the sum of the individual contributions estimated from observations or with models (Rahmstorf et al., 2007, 2012a), although in general the uncertainties were large enough that there was no significant contradiction. Second, it was not possible to make confident projections of the regional distribution of sea level rise. Third, there was insufficient understanding of the potential contributions from the ice sheets. In particular, the AR4 recognized that existing ice-sheet models were unable to simulate the recent observations of ice-sheet accelerations and that understanding of ice-sheet dynamics was too limited to assess the likelihood of continued acceleration or to provide a best estimate or an upper bound for their future contributions. Typically, the Summary for Policymakers (SPM) tells a very different story. “Very Likely” is 90 – 100 %. It is another example of the deliberate deception created by great differences between the Science Report and the SPM. It is impossible to discuss all the limitations of IPCC analysis of glacier changes that result in sea level change. Figure 3 from the IPCC AR5 Science Report shows the extent of the variables. Science distinguishes between Mountain (Alpine) and continental glaciers. In reality, the creation and mechanisms are the same Temperature receives most of the focus and public understanding about glaciers. 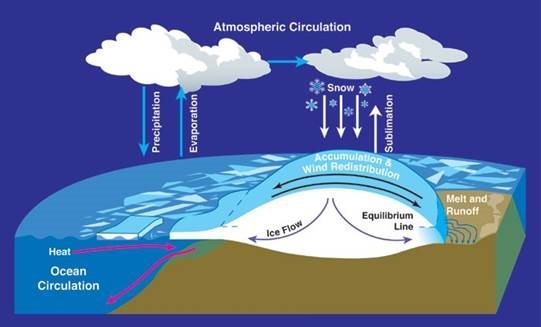 However, precipitation is equally important information and changes in what is called the Mass Balance of the glacier. The front of the glacier, called the snout in mountain glaciers, advances or retreats as much because of precipitation as temperature. A glacier forms when some snow survives the summer melt. That can occur because of lower temperatures or an increase in the volume of snow. 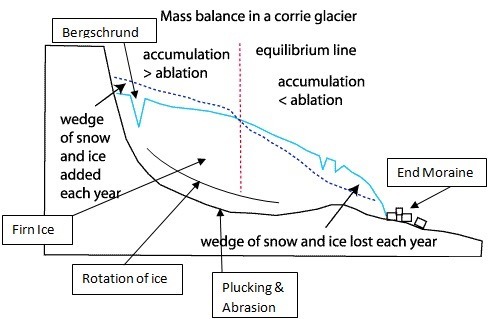 Figure 4 shows the dynamic balance of a glacier. The Equilibrium line moves with temperature but because of the gradient it takes a considerable change for it to move much and affect a significant area. A more significant factor is the change in the amount of snow in the accumulation zone. Obviously snowfall amounts vary in different regions and over time. This explains why glaciers in some regions advance while others retreat. Scientists track glacial change by measuring individual glaciers and comparing their size over time with records of the local and regional climate. But measuring every major glacier on Earth would be a monumental task. Approximately 160,000 glaciers occupy the Earth’s polar regions and high mountain environments, and sending a team to each one every year would be costly and difficult to coordinate. In addition, although a few research teams travel to a few glaciers each year to measure ice depth, size, movement, and water content, the data from individual glaciers don’t necessarily reveal how other glaciers in the same region—much less in other parts of the world—are changing. Even glaciers within the same region can react differently to environmental changes. For example, while most glaciers in Glacier National Park are retreating, some are advancing. The difficulty is biased reporting, as only retreating glaciers make the headlines. NASA is planning for better knowledge of the mass balance of Antarctica with a satellite. In 2017, NASA will launch ICESat-2, the follow-up mission to ICESat, which operated from 2003 to 2009. ICESat-2 will use laser altimetry to make precise measurements of glacier heights. Combined with the ICESat and IceBridge data records, the ICESat-2 measurements will allow for a continuous record of year-over-year change in some of the most remote regions of the world. The problem is the height of an ice mass like Antarctica is not an indicator of changing size or volume. As the mass at the center of the glacier increases the outward flow increases, thus reducing central mass and height (Figure 5). A 2012 article titled “Why ice loss and sea level measurements via satellite and the new Shepherd et al. paper are highly uncertain at the moment” spoke to the problems with the NASA claims. Another study reported by WUWT indicates a significant increase in snowfall over the East Antarctic Ice Sheet (EAIS). Enhanced snowfall on the East Antarctic ice sheet is projected to significantly mitigate 21st century global sea level rise. In recent years (2009 and 2011), regionally extreme snowfall anomalies in Dronning Maud Land, in the Atlantic sector of East Antarctica, have been observed. It has been unclear, however, whether these anomalies can be ascribed to natural decadal variability, or whether they could signal the beginning of a long-term increase of snowfall. Sea level rise due to melting ice is the one threat of global warming that worked effectively with the public. As the Paris Conference looms the alarmists increase the potential threats to ensure that action is taken. Hansen is one of the most active alarmists who used his position at NASA GISS to push alarmism and misinformation. A moment of serendipity occurred while researching this article. I typed the acronym WAIS into a search engine expecting West Antarctic Ice Sheet instead I got the Weschler Adult Intelligence Scale. Here is the definition. … the global capacity of a person to act purposefully, to think rationally, and to deal effectively with his environment.”‪] He (Weschler) believed that intelligence was made up of specific elements that could be isolated, defined, and subsequently measured. However, these individual elements were not entirely independent, but were all interrelated. His argument, in other words, is that general intelligence is composed of various specific and interrelated functions or elements that can be individually measured. It appears those studying WAIS are low on the WAIS scale. August 2, 2015 in Antarctic. Antarctica is running cold and so is the S. Ocean surrounding it,so why this article? It’s run up to Paris. There is a big push on climate change at the moment. They are desperate people. That “Red Hot” area in the Antarctic west is runninng at about -44 Degrees C.
Very likely to melt, not. However, the volcanoes under the glaciers appear to be “greasing” the area under them and allowing them to move faster than they would otherwise. Not much anyone will do about it, but the cargo cult likes to scream that it is the CO2 and not the volcanoes that are causing the problem. Speaking of which, does anybody know how well or poorly the GCM models account for the radioactive heating of the earth’s core and the transport of that heat to the surface? W = (5700-288) x 4.5 /(5250 x 1000) = 0.0046 Wm-2. With heat loss only from radiation this will warm the surface of 0.0015 C, which we assume it is now doing. But since it is so small it can be ignored. The transport of core heat to the Earth’s surface is not by conduction alone – Mr Petschauer to note. A considerable amount of thermal energy is given a fast track to the top via magma plumes and that certainly cannot be ignored. Richard, the “average” heat flow from the core is as meaningless as the average global temperature. The Antarctic Peninsula is a volcanic arc. The heat flow beneath the peninsula is far above average. In fact, if the volcanic behaviour of the peninsular field increased in activity, you could have subglacial eruptions. It happens on Iceland too. So, yeah, it could be a problem, and no amount of political and engineered energy controls will affect it. “That “Red Hot” area in the Antarctic west is runninng at about -44 Degrees C.
Everyone knows that CO2 makes ice melt at lower temperatures. It’s settled science. Jimmy (leave the windows open and turn off the air conditioner) and Eric (2, what is 2, I am French, I am above discussion) Rignot are pandering to the UN and Vatican for free rides and drinks at the Paris Party. With the Vatican in play, Jimmy will be auguring for deification. Essay Tipping Points in ebook Blowing Smoke covers both Greenland and Antarctic, specifically WAIS, and more specifically the Amundsen Embayment. Rignot’s newest finding concerns PIne Island Glacier. He says PIG ice loss is 4x what Zwally found in 2011. An outlier. It is true that the entire Amundsen Embayment catchment basin contains enough ice that IF it were to become barren, SLR would be 1.2 meters. BUT PIG plus Thwaites ( the other Amundsen Embayment glacier spilling into the sea) is only about 20% of the catchment. AND the un PR’d portion of Rignot’s 2014 paper found that the interior half of the catchment is creeping seaward very slowly or not at all, and that it is net gaining ice. Finally, a separate paper (Thomas 2013) analyzing yhe F10 ice core at the divide between PIG and Farrigno northwest of PIG showed greater past rates of warming (and cooling) in the 18th and 19th centuries than in the 20th. At that location, past natural variability exceeds the entire supposed AGW signal. I’m confused. Why would melting arctic ice raise sea level? Isn’t arctic ice all floating. And a floating body displaces its own weight. So if the arctic melts it exactly fits into the sea water that it is currently displacing. That is true even if there is fresh water there (or boulders for that matter). If the ice in your margarita melts the level does not change. Paul, melting Arctic ice cannot raise sea levels. Ice is 90% of the density of water, so it floats with only 10% above the water’s surface. As it melts it increases in density and therefore decreases in volume. The warmists don’t want that to become generally known, because even fewer people would believe their drivel. It is easily checked, take a glass, put a couple of ice cubes into it and then fill to the brim with water. The ice will float and part of it will protrude over the brim of the glass, but as it melts there will be no change in the level of the water. A better experiment would be to place 2 ice cubes in a half full glass of water. The height of water changes at that time. With the Arctic sea ice this height increase is already counted. Also the Arctic sea ice melts 60% each summer anyway. If the glass is half filled with Scotch the experiment is even more interesting. Archimedes must be spinning in his grave. @ urederra – Spinning in his bath, surely? Curious story worth searching re: his tomb. Find Cicero’s find, fine friends. I agree, melting of floating sea ice to water at 0 degrees C should not affect the sea level, unless there is some obscure salinity effect I have not thought of. Interestingly, water becomes more dense as it warms from 0 to about 4 degrees C, so in the short term at least, the meltwater would decrease in volume as it continued to warm. Depending on the average temperature of the Arctic sea, the effect of melting sea ice might even be to reduce overall sea level. Well there is landed ice in the Arctic, Northern Greenland has a huge reservoir. However Northern Greenland appears to be extraordinarily stable. It is the south that ebbs and flows. Usually they lump in Greenland. If all the Greenland ice melted at once the oceans would rise a few feet. And at current rate a quarter of a million years. Not my problem nor the next 20 generations. Folk are getting smarter they will think of a lot of clever things. The biggest threat to humans is the absorption of the best brains into the spin community when they should be working on solution if they were to be needed and I’m still not convinced but in my generation they will know and that still leaves truckloads of generations to fix any defined problem. Aboriginals walked to Tasmania across the 60 metre deep Bass Strait 8,000-12,000 years ago before the last glacial minimum. THAT is more than a few feet. Oceans go up, oceans go down. Here’s a take on what happened to Greenland’s ice sheet during the last interglacial, the Eemian, when it was ~2°C warmer for around 4000 years. Couldn’t melt it all then, won’t melt it all this time. Yes, spot on Paul, ‘exactly’ IS the word. Not ‘likely’. There is likely a minimal sea level change because the ice is 6-7 percent greater in volume, but that is likely balanced because a portion of the sea ice is above sea level. I honestly just get confused at this point. We are told unusual rates of melting is going on, and the surface of the ocean is warmer with its accompanying thermal expansion, yet the rate of sea level rise is not increasing. So then I am left wondering if these claims are science based or faith based? Neither, they are lie based. I have witnessed this myself, many many times. The new satellite measures ice height more accurately. When added to ice extent you get volume. I think the latest measurements were for mass rather than volume which is more meaningful as the lower ice is denser, the air having been squeezed out. GRACE measures mass. ICESat measured height and extent. Gives different answers. We produced GRACE time series for locations on a regular 500 km grid across Antarctica using the Gaussian spatial averaging approach of Wahr et al. (1998) with an averaging radius of 400 km. Since the size of the grid is at the limits of the resolution of the GRACE data, signal may leak from one grid point to another. We did not attempt to correct for this problem, nor is this effect included in our uncertainty estimates. I was trying to get a grip on the resolution of each GRACE pass/orbit given that individual glaciers are likely below the resolution limits. Mountain glaciers outside of the poles have no effect to speak of on sea levels. And this essay correctly points out that Eastern Antarctica has been unstable as long as studied. Yet the ice keeps on flowing into the sea. And speaking of sea level volume increase via warmer water, I note that sea level rise has slowed recently, in spite of the claim the lost warmth is hiding below 2,000 meters, as if that were likely. This essay points out that “the West Antarctic ice sheet, lying largely in the western hemisphere, might be unstable and might decay relatively rapidly…” It doesn’t say that Eastern Antarctica is unstable. Was that a typo? EAIS is stable, meaning two things. 1. Anchored (by mountains) so cannot creep off into the sea. 2. Gaining ice mass. Whether WAIS is stable or [unstable] depends on where you look. ANDRILL showed Ross is stable; Hansen argues increasing sea ice will make it unstable. The arguement is an [extension] of the Thwaites glacier (Amundsen Embayment) [model] paper, while ignoring that paper’s findings that this would (if it happened) take several hundred years. Rignot found PIG unstable; his GT/yr loss is 4 x the previous estimates (Zwally 2011 and 2012). And Hansens extension [to the] entire Amundsen Embayment catchment basin is ludicrous. See comment upthread. doi:10.1002/2013GL059069). This is an interesting publication because it shows in Fig. 4 that DATA for the sum of all galcier ice flux is no longer accelerating, and the largest ( Pine Island ) is decelerating. The text of Rignot only emphasizes what happened pre 2010, which I feel is disingenuous if not dishonest. All part of the deception you have definitely caught onto. And Rignot is a co-author. What does that say about him, his immediate employer JPL, and JPL’s employer NASA? Oh my, did we not just cycle back to Hansen’s NASA GISS division? My, oh my. Birds of a feather flock together. Particularly critical this breathing together since a sudden disintegration in the West Ice is the source for the fearful meme of very sudden sea level rise. An early clue for me was when Nature blushed livid pink with the temporal and spatial smearing of Palmer Peninsula heat all over the rest of the Antarctic, particularly the West. This is an important meme, necessary to the fear and guilt based narrative, and is thus extremely perverting. We’ll feel sorry for these people some day. Well, more of us will. Actually, Rignot is a professor at UC Irvine, and has a summer position at JPL. I would not assume that because JPL contracts to NASA that they necessarily see eye to eye, or are birds of a feather. Some personnel, certainly, but the organizations, nope. Idiots. No, seeing as the next shindig is in Paris, Cretins. See how long the ice piles remained in Boston and Buffalo from last winters’ storms. Big chunks of ice do tend to hang on quite a while even in the sun. Another industry on the climate change bandwagon. Article helps to explain why property insurance costs are rising due climate change caused disasters. An easy read for the general public. “I…Why would I question a narrative that gives me the political cover to jack up the price of what I am selling? It’s rising because they have a new meme to justify the increase. Storms? Increasing…tornadoes, hurricanes, floods, etc…all increasing, so they must charge more money for all of the losses due to climate…which, of course, is total bull$hit. I read somewhere the re-insurors will make a killing. I don’t know nuthin’ ’bout it. Down here in Florida where cities use SLR as a means to get sate and federal funds to upgrade their sewer systems, we have a conferences on SLR, which are sponsored by SwissRE. The portion of ice above sea level must equal the change in volume. It is the displacement that makes the ice float by that amount. Thus there cannot be any rise in sea levels due the melting of ice. If you think Archimedes was right, yes. Change in sea ice per se cannot affect SLR any more than melting ice cubes in a glass of iced tea changes the ‘fullness’ of the glass. There is much agitation about Antarctic ice melting, inundating the planet. A little perspective comes from reflecting that the dramatic iceberg calving waved in our faces amid proclamations of doom from the usual sources (sadly, including NASA) really don’t raise sea level, since the ice was already afloat. The only relevant question is, how fast are land-based glaciers melting? A hint comes from a paper by P. Kuipers Munneke, et al., who estimate that ice is melting from the glaciers at the rate of 89 Gt/yr +/- 41 Gt/yr (std dev. ), and that this rate has been steady from 1979. A back-of-the envelope calculation: 89Gt = 89×10^9 m^3 (roughly). Dividing this by the surface area of the oceans (3.6 x 10^14 m^2) gives 2.5×10^-4 m, or 0.3 mm of sea level rise/yr. I crudely estimate ice mass at 1 tonne/m^3. Also, at this rate of ice loss it would take 31×10^15 tonnes/ 89×10^9 tonnes/yr = 350,000 yr to melt the entire Antarctic continent. That would, indeed, raise your sea level some 86m. But I think we can wait. and E. van Meijgaard, Insignificant change in Antarctic snowmelt volume since 1979, Gphys. Res. Letters, VOL. 39, L01501, 2012.
also see Wikipedia for ocean volume, continental ice mass. It is only the WAIS, not the much larger eastern Antarctica,. so safe for even longer. That’s for water. Ice will be 90% of that. The thing to look at is how much heat it will take to melt all that ice. 80 calories per gram, 80,000 calories per liter, 80 million calories for a tonne of ice. And that’s in excess of what we’re getting from the sun currently. On the outer surface of the Earth’s atmosphere the irradiance is known as the solar constant and is equal to about 1367 Watts per square meter. Since the Earth’s cross sectional area is 127,400,000 km², the total Sun’s power it intercepted by the Earth is 1.740×E17 Watts but as it rotates, no energy is received during the night and the Sun’s energy is distributed across the Earth’s entire surface area, most of which is not normal to the Sun’s rays for most of the day, so that the average insolation is only one quarter of the solar constant or about 342 Watts per square meter. Taking into account the seasonal and climatic conditions the actual power reaching the ground generally averages less than 200 Watts per square meter. Thus the average power intercepted at any time by the earth’s surface is around 127.4 X 106 X 106 X 200 = 25.4 X E15 Watts. 2.19456E+21 Joules/Day / 4.13E+17 Joules per Km^3 == 5313. Km^3/day max melt with all the solar energy used to melt the ice to average ocean temperature of 4 C.
The ice cores from this study were analyzed to look for recent changes in accumulation rates. The period 1970–present was chosen due to numerous previous studies reporting changes in accumulation during this same time period. Mean accumulation since 1970 for each site was compared to the long-term mean and, due to the different time period covered by each record, the mean from 1922 to 1991 (the period of overlap between records) (Table 2). Results for cores 01-5 and 99-1 are disregarded because of the possible need for topographic corrections (see previous section). The results indicate a slight decrease (1–4%) in accumulation at sites 00-4, RIDS C and Siple Dome, and a larger decrease (9%) at site 00-5. Accumulation increased (5–10%) at sites 01-3, 01-2 and 00-1. The geographical clustering of these sites suggests that there has been an increase in accumulation since 1970 in the western sector of the Pine Island–Thwaites drainage system (00-1, 01-2, 01-3) (Fig. 2; Table 2). So they compare average accumulation 1922 to 1991 against 1970 to present (2005). It would take a 100% decrease before any ‘Alarming loss’ is seen. So far only one core is 9% less than average and the whole group shows growth not melting. i guess if all the ice melts, we’ll just have to die. no need to walk to higher land. Misspelling alert: WAIS (the second meaning) should begin with Wechsler, not Weschler. (I know some people named Wechsler, so I’m familiar with the name; I checked WAIS, and Wechsler (in German pronounced vexler) is correct. Aside from that, a most illuminating article. Wechsler means “changer,” maybe as in money changer. As I’ve said in earlier postings, Sea-Level in the Gulf of Maine was 3mm higher than today in 2005. It had a few ups and downs in the 9 year interval, but essentially it hasn’t changed. Going back to 1947, Sea-Level in the Gulf of Maine was identical to today’s. Yes, identical!!! There were a few ups and downs in the 68 year interval, but essentially it hasn’t changed. When is the sea slated to rise??? As it hasn’t figured out a way to do so in the last seven decades, what (other than the National Climate Assessment) makes anyone think it is suddenly going to rise 4 to six feet by century’s end??? Measured by the Portland Maine Tide Gauge – no adjustments, corrections, GIA factors or anything equally stupid, and no tectonic influences either. Bet the farm that each frightening headline about Sea-Level is designed to enhance the December Paris party. Imagine the revenue gushing into the Parisian luxury hotels during their ordinarily slack season. For some attendees, it will be a statistically significant portion of their nation’s GDP!!! How much of the current increase in sea level rise is due to soil run-off deposited in ocean deltas? It’s a pretty small contribution, about 0.05mm/year. The problem with Portland is that it sits in a tectonically active region. Just how much of that change is due to actual eustatic changes in sea level remains moot. It seems a lot of the WAIS is at or below sea level. True, due to isostatic compression from the weight of ice above. Been that way for millions of years (Ross ANDRILL). Very unlikely to change anytime soon. Time in millennia. To a farmer in Minnesota from a farmer in Wisconsin. BTW, if Hansen is right our land value goes up a lot. Conflict of interest declared. Trying not to be cranky tonight, but you all really could do better for yourselves. IMO, pathetic. And if those don’t work cause I made typos late this Sunday night, do try fifteen seconds of googling around for yourselves to find the same direct links. Nits, but your graphic from Bellinghausen is not exactly right. The WAIS lies west of the continental divide (red), not the black line. And the labeled Flitchner ice shelf is actually two, the much larger Ronne and smaller Flitchner, separated by an eponymous island of same name. Ronne is stable or gaining mass. Essay Tipping Points. The A-B line is a section line for the elevation graphic, not the WAIS border. I never noticed that there was an island in the Ross shelf. Google Earth doesn’t have it labelled, so is it Ronne or Flitchner? Mike, not the Ross. The Ronne/Flitchner divide. It seems reasonable to postulate that as glaciers melt, not all of their melt-water ends up in the oceans. The soil and subterranean aquifers should take on more water, and the atmosphere should increase in its average humidity. Any calculations as to what those sinks might absorb? There have been some peer reviewed attempts to explain the recent SLR ‘deceleration’. Not glacial melt, rather rainfall. Essay Pseudoprecision deconstructs those in a rather convincing and amusing fashion. IMO a very perceptive comment. The British Admiralty a couple of centuries ago took on the task of mapping and charting the entire world at the time a task like putting man on the moon. They marked low tide dry rocks all over the world, these rocks are still dry rocks at low tide, using the original data these rocks are easy to find. The seas have been very stable and those rocks are disproof of the warmanists armagedon. Actually, if they are so steady, it’s a sign of a pause, er, plateau, er oncoming hiatus, er, perhaps the next major move will be sea level drop. Correct, the long tail of the Great Melt is running out of steam. Recognizing this would be a small effect because not a big percentage of the Oceans water is below 40F, but, warming water TO 40F reduces volume. So the really cold stuff down deep will shrink, balancing some volume of stuff that does expand. Still messes with the actual effect. I understand the effect is small but since conditions will NOT lead to total melting a few hundred cubic kilometers counts. 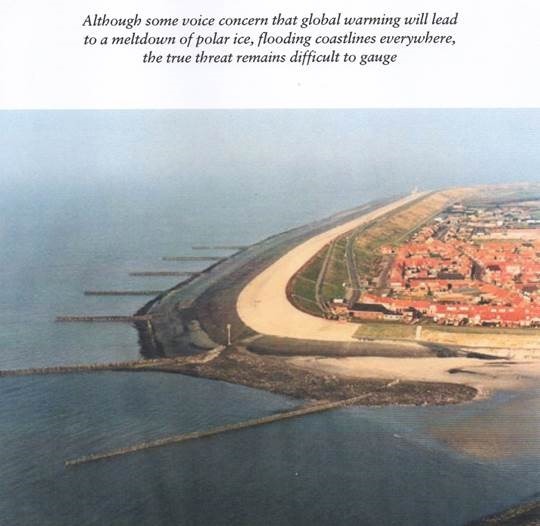 Because water volume contracts as the temperature increases from approx 0 C to 4 C, Trenberth’s “hidden heat” could potentially lower sea level? Not true of ocean water which has its maximum density at the melting point. Actually, most of the volume of water in the oceans IS about 40F. Great Tom, I think we are converging to much clearer meanings across various cultures here. Please get the “inconclusive” out! By the way, “possible” still has some logical issues … but “quite possible” conveys medium confidence better-but then why not use “medium confidence” … please get rid of the ridiculous “inconclusive” for the 34% to 66% subjective probability range. It will convey a completely differnt meaning to lay persons-read decisionmakers-since that probability range represents medium levels of confidence, not rare events. A phrase like “quite possible” is closer to popular lexicon, but “inconclusive” applies as well to very likely or very unlikely events and is undoubtedly going to be misinterpreted on the outside. And a cold wind blows from the most southerly of continents. With more precipitation from ocean warming, increased snowfall that does not melt during the year will increase glacier size offsetting glacier melting to some, perhaps large, extent. Hoping I missed where this was pointed out, but melting sea ice, as in below sea level ice unless there are Death Valley like below sea level land depressions in Antarctica and Greenland, will not raise sea level. Pretty much because the molecular weight of water remains the same in all its physical states. If you don’t believe this, pour yourself a glass of ice water and watch the level as the ice melts. Science distinguishes between Mountain (Alpine) and continental glaciers. In reality, the creation and mechanisms are the same. Temperature receives most of the focus and public understanding about glaciers. We need to expand this definition a little bit better. Mountain glaciers = As drawn above. The glacier starts up high, snow and ice are deposited high, the glacier mass slides down (sometimes rotating as drawn when the valley slopes enough), and eventually melts out at low levels in the heat. The water will eventually run off to streams, lakes and eventually the ocean below. 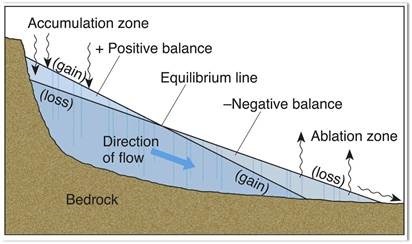 Resistance to flow is the slope of the valley, the roughness of the glacier valley, the resistance to flow of the glacier up higher due to the dead weight (mass and volume) of the glacier down low. No surprises, right? About what you would expect, and what the elementary grade climate books explain. This rudimentary diagram (cross-section) and explanation are correct ONLY for the short coastal glaciers around the Greenland periphery! The description works ONLY for the 5 – 15 kilometer coastal glaciers facing the sea AROUND the Greenland island and the West Antarctic Peninsula! Those glaciers – some 5-8% of the total icecap) do “flow downhill” to the sea, and – over time their mass flows as shown. But for all of the 90% of Greenland’s interior icecap and vast majority of the East Antarctic land ice “glaciers”, this is incomplete and – because it is incomplete – it is very misleading. Central Greenland is surrounded (south, west, north, and east) by very high, bare rock mountains. All of the interior ice flows downhill – or tries to – as the diagrams above show. But the west-flowing ice trying to move “downhill” from the east coast mountain ranges is trapped by the east-flowing glacier ice flowing “downhill” from the west coastal mountain ranges. North-flowing glaciers are trapped by the south-flowing glacier ice. Thus, none of the interior ice can “flow downhill” in any direction – it is trapped in a bowl in the hundreds of kilometers between the coastal mountain ranges. This trapped interior ice builds up over time (WWII airplanes were covered by over 200 feet of new ice and snow in just 50 years). Today, the central icecap is several thousand meters higher than the mountainous rocky edges holding it in, but the length of the slope from the interior to the coastal ranges is so small there is no movement. There is no effective gravity forces pulling it sideways and downhill – unlike a coastal or mountain glacier that NASA describes so fearfully.. Thus. even if the assumed 25 degree temperature rise required to “melt Greenland icecap” (or the East Antarctic icecap) were to occur somehow, the interior ice could not flow catastrophically out to sea as postulated by NASA. The water would have to refill the interior basin (now 1000 meters below sea level) and would have to “leak out” through the few valley passes left open. I once caught an ice researcher being cagey about just how much of a bowl the Greenland Ice Cap is in. That the whole thing will suddenly slide or melt is an important meme for the fear and guilt based catastrophic alarm, and the deadly urge to action. A CRESiS engineer no less. Bah! The correct answer to this is “definitely true”. As ice freezes it preferentially excludes salt. Fresh water is less dense than salt water. A floating object displaces its own weight of water, which means a less dense object displaces less than its own equivalent volume of fluid. So a fresh water iceberg displaces less salt water in volume than its own volume after it has melted. So some water is left over and it raises the sea level. The effect is tiny. But it is real, and it is certain. And the questionnaire is, as usual for alarmists, presented in a binary either/or way. “Scientists agree!!! Melting sea ice raises ocean levels!!! !” Don’t tell anyone you’re not talking about the bulk, 100% contribution, that land ice has. Oh no, just leave the fact that you’re talking about a minute effect unspoken, so people get the wrong take-home message from the facts. Also, respondents are left in a “catch-22” situation. Does someone like me, who knows the facts I just presented above, answer yes, or no? If I say yes, I contribute to the alarmism, if I say no, I show my ignorance of physics. So in short, the questionnaire is dishonest, biased, and unfair. The facts are, close enough, melting sea ice doesn’t raise sea levels. Or, put another way, they make next to no difference (but not no difference). The fact that Yale Researchers think it is just fine to claim that melting of “Sea ice on the Arctic Ocean” is True upsets me. If it all melted the direct result would be no increase in sea level. According to paleoclimatology data, previous interglacial periods experienced about 110 meters of sea rise following past glaciation events. Since total sea rise of the current interglacial has been about 100 meters, seas will likely rise another 10 meters before the next glaciation period begins. Sea rise during the 19th and 20th centuries were both around 6″/century (15 cm), and 21st century sea rise will likely be about the same, despite all the CAGW scaremongering. If current trends continue, we still have another 6,600 years before the next glaciation period begins. Another glaciation will happen again. All scientists acknowledge this certainty… CO2 has almost nothing to do with it one way or another. When the Milankovitch cycles turn to their cold cycles in about 6,000 years or so, the earth will enter another glaciation period, which will kill billions of people. How the hell can melting sea ice cause rising sea levels? Yale must be stupid. Go check with Al Gore! 676=3.43 x 10^8 Δr or Δr = 1.97×10^-6 km = 1.97 x10^-3 m = 1.97 mm total. So the Yale professors think that if ALL the arctic ice melted that we should be aware of this massive swing of 2mm in sea level as an important ‘contribution’ to sea level rise, while they are actually worried about measuring sea-level change 3-12 feet. Their standard of importance is anything that would affect something at the .006% level! Wow amazingly low bar. Yet, even if the ice melts, since the weight of the ice already accounted for by Archimede’s Principle, their conclusion seems to be in error. Since the weight does not change, neither should the displacement. The only change should be due to thermal expansion of the melt water. We need a timeline on when climate uncertainty was eliminated from science, science policy, and science news reporting. A detailed investigative book author along the lines of Robert Caro is in order on who, what, when, and where for the historical record on the new climate policy dark ages when doubt disappeared and how we got here. BTW – really neat photo of the Netherlands up at the top of the thread. Most of the sea level rise has already occurred and there is very little left to go. Thank you, Dr. Ball. This is a really helpful and valuable article. (Needs a bit of editing for typos, though. If that is a defining relative clause, and it looks like one, there should be no comma after “level”. If it is non-defining, there should be another comma before “who”. The full stop after “same” got lost.